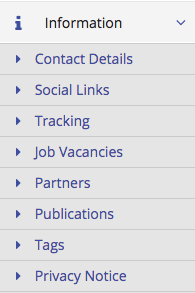 Tags are used to group together different types of relevant content on your site and display it together. Blogs, news articles, events, pages can all be tagged. If it is a new tag, that doesn't already exist, you should type it in the "New Tags" field. If the tag already exists you should type it in the "Tags" field. The same tag must be present on the post and the page you want it to appear on. The three most recent tagged news/events/blogs will show at the bottom of the page where the tag has been added. Tags can be added, edited and deleted from the Information menu, under Tags. You can edit a tag by hitting the blue button. A tag can be deleted by pressing the red bin on the same line as the tag.